If you only need one of the two camera styles, you can skip the section covering the other, or you can adapt the approach found here to your own custom camera control scheme. To see how your camera control scheme is working, you will need a visual representation for the Player entity. Unity represents SpatialOS entities by instantiating a prefab of the correct type into the scene. The EntityTemplate for Player entities in the Starter Project codebase specifies that it will use the EntityPrefab named “Player”. You can find this prefab in the Assets/EntityPrefabs folder. Drag the existing Player prefab into the scene. Right-click it in the scene hierarchy. 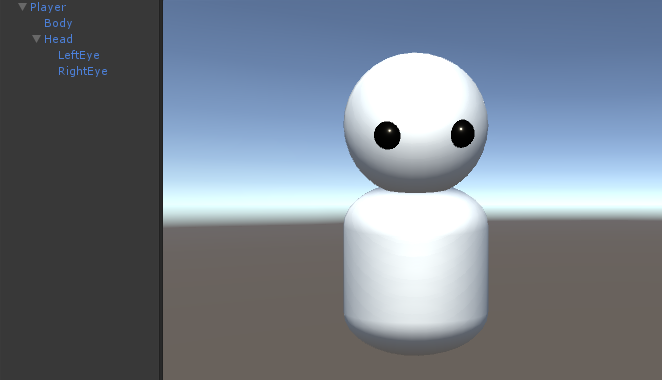 Add some default Unity 3D Objects as children of the prefab root. This simple example prefab includes some spheres for eyes to allow you to verify which direction the Player GameObject is facing. Apply the changes to the prefab. Remove the Player GameObject from the scene. Keeping it in the scene will cause errors, because the player needs to be instantiated by SpatialOS. If you placed a camera on the Player EntityPrefab itself, you’d run into problems: when two players are visualized on the same client, each of them would be instantiated with a camera, which would not work as expected. The most commonly used camera perspectives are first-person and third-person Depending on your game’s camera control scheme you may wish to add one or both of the scripts to your Player EntityPrefab. The Starter Project already contains a camera in the scene called MainCamera, and the first-person and third-person camera control scripts below will refer to that camera. Third-person cameras float above the Player character’s head and look down, so you can see both the player’s model and some of the environment in front of them. They typically also allow the user to rotate the view to observe the environment but not affect the orientation of the Player avatar itself. Using the [Require] attribute and a Writer object ensures a script is only enabled on workers which have write access over the specified component. The ACL for the Player entity template specifies that only the client that owns this Player entity can have write access to the ClientConnection component. This means that for any given Player entity, its camera control scripts will only run on the corresponding client. Later, you will also add some mouse controls to rotate the camera. Export prefabs using the menu Improbable > Prefabs > Export All EntityPrefabs. Run the simulation with spatial local launch. 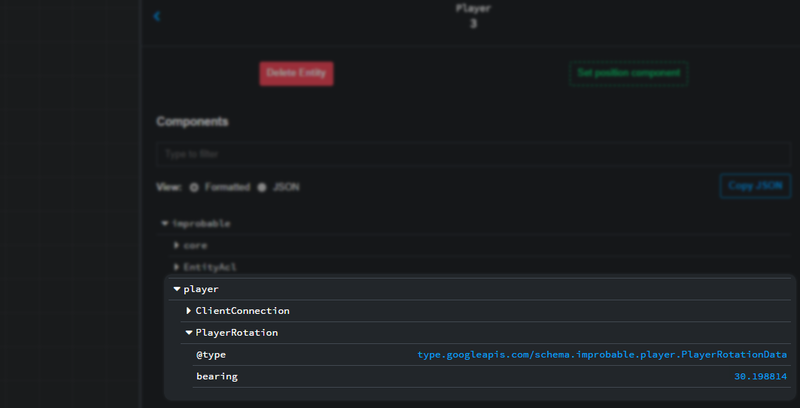 Connect a client through your Unity instance. For a classic third-person camera you should enable the user to adjust the camera pitch, yaw and distance to the avatar using their mouse. In the following script the camera pitch and yaw are adjusted based on the movement of the mouse within the viewport while the user is holding down the right mouse button. The camera’s distance to the player model is adjusted by scrolling of the user’s mouse wheel. Make sure ThirdPersonCamera.cs is on the Player prefab. Hold right-click on your mouse and rotate the camera around the player character. From the positions of the player and the cube (which is present in the Starter Project’s client scene), you can see that the camera is rotating, rather than the player character themselves. The position of the first-person camera remains fixed relative to the character model, with the pitch and yaw once again changing based on mouse movement. As in the third-person example above, make the first-person camera control script run only on the controlling player’s client by using SpatialOS syntax to require a ClientConnection writer. Make sure FirstPersonCamera.cs script is on the Player prefab. If the ThirdPersonCamera.cs script was previously added to the Player prefab, remove it. The current implementation in both first-person and third-person is a “free-look” mode which rotates the camera but does not affect the direction the player model is facing. Add this line to the bottom of the SetCameraRotation() function, inside FirstPersonCamera.cs This behaviour is standard and expected for first-person camera schemes, but this line of code could also be used in a third-person script for an “over the shoulder” camera scheme. So far these camera rotations and player model rotations are entirely client-side, seen only by the player themselves. To allow other clients (and the server) to rotate their own local models of the Player entity, the rotation information needs to be synchronised across SpatialOS. As previously stated, most games only require the entity’s rotation around the up-vector (the y-axis in Unity’s coordinate system) to be visualized for other players. This means you can represent the entity’s rotation using a single float value. This specifies a new component called PlayerRotation with a float property called bearing (as in a compass). Run spatial codegen in your terminal to auto-generate associated C# classes. If you want to use 3D rotation, you can create a component which uses a quaternion instead of a float. Set the ACL for the new component. To provide a highly responsive experience, player rotation should be made client-side authoritative by giving the user’s client write access to the new component. This is especially necessary for first-person camera schemes, though third-person camera setups may be more forgiving. The Starter Project defines the Player entity template in Assets/EntityTemplateFactory.cs. Use the inspector to see the bearing value update as the client’s Player looks around. Lastly, you want to visualize this rotation on all other clients. To do this you’ll use a script similar to TransformReceiver.cs in the Starter Project. TransformReceiver reads the entity’s position property from the WorldTransform component and updates the position of the entity’s local GameObject representation accordingly. TransformReceiver only requires a Reader, as it is intended to be run on non-authoritative workers, which will not be sending any information back to SpatialOS. Callbacks are attached to the ComponentUpdated event which ensures every time the component’s properties are changed the receiver script updates the local representation om the worker it is running. PlayerRotation needs to run on all client and server-side workers, except for the client controlling that Player entity. That client, which has write access to the PlayerRotation component, doesn’t need to read from the component as it is the one sending the updates! Protection against running on the authoritative worker is given by the conditional PlayerRotationReader.Authority == Authority.NotAuthoritative in OnComponentUpdated(...). Without this check, a player’s rotation would be set by two different scripts; the camera script that updates transform.rotation based on mouse-movement, and the value synchronised across SpatialOS. Nothing feels more responsive than code running client-side, so the Authority check ensures a responsive feel. You’ve now implemented a client-side camera control script which sends the player’s view direction to all other workers, both clients and server-side, which will continually update their local representations of that entity. In the above examples the camera’s yaw (horizontal look direction; rotation around up-vector) is used to rotate the player’s model, which is then synchronised across all workers. To synchronise the vertical look direction (i.e if a player is looking at the sky, or aiming down at the ground) across all workers, you will need to add an additional property to your component and set it using the rotation of the player around the right-vector (the x-axis in Unity’s coordinate system). Use a keypress to toggle between first and third-person camera schemes. Use separate properties for ‘look-direction’ and ‘facing-direction’ to allow players to be visualized running in one direction while looking to the side. Whether your game involves firing guns or planting flowers, drawing a visual indicator in the centre of the screen will dramatically improve aiming precision.